If you have any interest in start ups you cannot help but be familiar with the word ‘disruption’. From Air BnB and the hotel industry, to Uber and taxis, innovative start ups have shown a tremendous ability to shake up traditional and well-established industries. The frequency and intensity of the impacts that start ups can have means that disruption is no longer just a description of their success, it has become a principle central to their existence. Whilst disruption can happen at a local level, most aim to achieve an impact on a much larger scale: a global one. In the past achieving a multi-national presence would have come as a result of a long period of growth. A company would build its resources and customer base, shifting from its initial form into an SME, and upwards. However, with the advent of cloud technology, start ups have the ability to gain a global presence from day one, and challenge even the largest of industries. The cloud has shaken up resource allocation in way that has completely changed how business operate. By using the infrastructure of a cloud provider you remove the need to spend large amounts of capital establishing, maintaining, and upgrading your own internal infrastructure. You also cut down the need for in-house specialists, or can allow your IT team to better spend their time elsewhere. 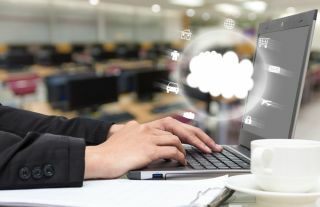 In this regard using the cloud is also very adaptable, as you can vary from the using it for all of your IT needs, to having it complement your in-house infrastructure as your start-up grows. There is also no need to plan your office around the need to contain bulky servers. Without the need for new hardware, extensive knowledge, or space, the scale-up process enabled by the cloud can happen as quickly as you need it to, rather than taking a great deal of planning. In line with this, cloud providers often allow you to set up a ‘pay-per-use’ model, which ensures you are not paying more than you need to. Many provide signup incentives targeted specifically at startups, which can give you time to gauge which cloud plan is best for you, without unnecessarily spending money. Alongside this, you’ll benefit from the constant support offered by the provider’s teams, which will help you work out exactly how best to benefit from the cloud. Not only does the cloud save you money and time in terms of infrastructure, it also means there is no need to travel great distances for face-to-face meetings, as video conferencing utilities allow you to connect instantaneously. Similarly, Cloud-VoIP tools are also a lot cheaper than international phone calls. Time and money are the two most crucial things to any business, of any size. By using the cloud as a start up, you will benefit from more of both being available. Rather than building your server network, you can build your team, pay them better, and make sure their time is spent working towards your success. Building on the idea that the cloud can cut down the need for international travel, it also allows you to pool talent across-borders with ease. In a start-up, talent is crucial, and the conventional approach of hiring those who can work within commuting distance of an office is removed. Instead, you can create a team from several different countries, with various talents and networks, whilst still allowing them to collaborate with ease. Meetings, file sharing and internal communication platforms can all happen on the cloud, which means not only are you not tied to a location, you are not tied to your devices. Work can be accessed from a variety of places, whether that be a laptop in the office, or a mobile device whilst on the move. This sort of global approach steps beyond borders and the conventional bureaucracy that might normally be faced when establishing a global team. If one thing remains crucial when trying to match up against large corporations, it is the need to establish and maintain a strong reputation, rather than being seen as a small entity. At the heart of this is the security and reliability larger organisations are perceived to offer. By using a cloud provider, you allow them to handle this for you. Data centers are often certified by several external bodies, governed by regulations, and benefit from multiple contingency plans. It would not be practical for a single start-up to try and establish such a rigorous approach to security from day one. By using a cloud provider, you allow them to put their resources towards making sure your network is secure and stable, rather than having to build your own approach to security and reliability from scratch. Providers upgrade and maintain their services to ensure that you are receiving the best support, and need not worry about security issues. With support like this, start ups can confidently maintain a reliable relationship with their customer base. On top of shifting the ways in which we have conventionally approached business, freeing up time, saving money, and allowing a global workforce and presence, the cloud also positions you as ready to adapt to the latest innovations. Cloud providers ensure that they are ready to support your adoption of innovative technologies, whether that be blockchain, or AI than assist in the interpretation of big data. Overall, it clear that no start up can afford to miss out on the support the cloud can provide. Across all aspects of growing an idea into a disruptive force, the cloud has enabled us to rethink the way we do business. What would once have taken years to develop is now easily accessible, and will allow you to compete on a global level from day one.